Pl. Hort. Schoenbr. 4: 4, t. 407 (1804). The flowers vary from pink to bright red, are borne on a stout stalk. Origin and Habitat: Eastern Cape, Western Cape (from Clanwilliam to Port Elizabeth), Republic of South Africa. Habitat and ecology: Haemanthus sanguineus occurs in the fynbos vegetation. It has a wide distribution and is fairly common in seasonally moist habitats on the lower slopes in dampish areas on clay or sandy and loamy soils, and on mountains and coastal flats. It is mainly from the winter-rainfall area and is dormant during the summer and cannot be seen. Flowering late summer to fall (January to April), especially after fire. Haemanthus incarnatus Burch. ex Herb. Haemanthus lambertianus Schult. & Schult.f. Description: Haemanthus sanguineus is an erect, fleshy bulbous perennial, 5–30 cm tall, with beautifully downy, leathery leaves, often outlined with red that lie flat on the ground. In the autumn a striking flower head emerges from the ground. It is large, circular, surrounded by leathery bracts, crammed with a mass of tiny, pink to deep red flowers with bright yellow anthers, borne at the top of a thick, cylindrical, red stem usually during late winter, or spring. The flowers, that vary from pink to bright red, are borne on a stout wine-red unmarked stalk. Bulb: Oblong, compressed, 7,5 cm in diameter, tunics thick, whitish. Leaves: Two (or three), absent at flowering, prostrate (pressed to the ground), rounded to tongue shaped, and leathery, up to 25-30 cm long, 5-8 cm broad above the middle, green, glabrous, unspotted, with cartilaginous margins often edged with red. There are no markings on the underside of the leaves. The leaves are deciduous and appear after flowering in the autumn and winter (April until November ). The previous year's dry brown leaves may be seen. Inflorescence: A somewhat compressed compact umbel. Peduncle produced before the leaves (between the dried leaves of previous year), stout, compressed, glabrous, unspotted, 20-22,5 cm long pink to wine-red. Umbel (flowers head) dense, globose. Pedicels as long as the flowers. Bracts 6-8(-12), leathery, lanceolate, acute, reddish, ascending, 2.5-4 cm long. Flowers. Numerous narrow red or pink. Perianth 18 mm long; tube whitish; segments lanceolate, obtuse, blood-red, 12 mm long; filaments exserted; anthers oblong, yellow; style overtopping the anthers. Similar species: H. sanguineus is similar to Haemanthus coccineus, but the latter has a stem that is spotted and barred, and longer leaves. 6) Goldblatt, P. and Manning, J.C. 2000. “Cape Plants: A conspectus of the Cape Flora of South Africa”. Strelitzia 9. National Botanical Institute, Cape Town. 7) Raimondo, D., von Staden, L., Foden, W., Victor, J.E., Helme, N.A., Turner, R.C., Kamundi, D.A. and Manyama, P.A. 2009. “Red List of South African Plants”. Strelitzia 25. South African National Biodiversity Institute, Pretoria. 8) Vlok, J. and Schutte-Vlok, A.L. 2010. “Plants of the Klein Karoo”. Umdaus Press, Hatfield. 10) Wikipedia contributors. 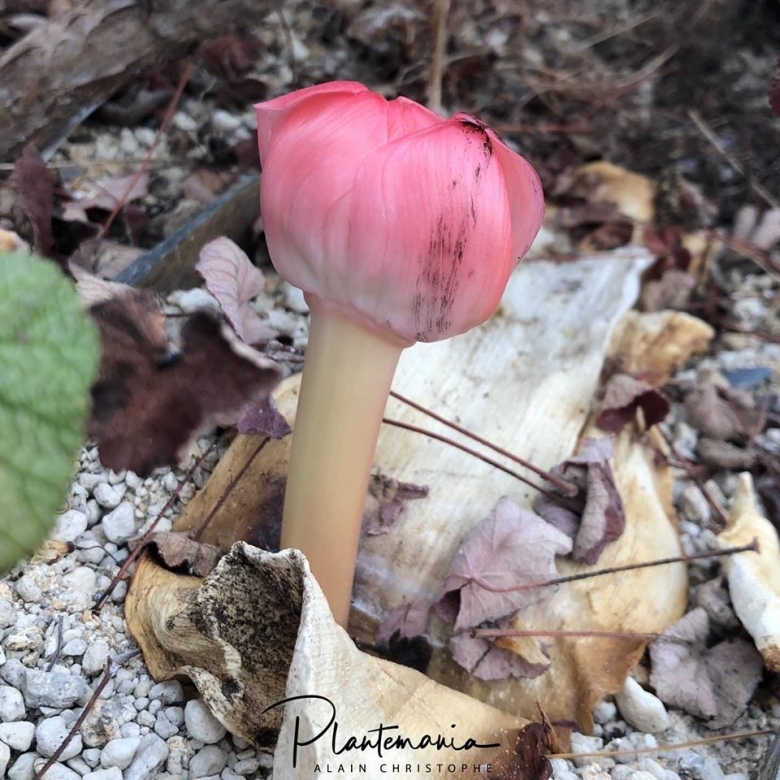 "Haemanthus sanguineus." Wikipedia, The Free Encyclopedia. Wikipedia, The Free Encyclopedia, 9 Feb. 2018. Web. 3 Sep. 2018. 12) Pacific Bulb Society contributors "Haemanthus sanguineus." Pacific Bulb Society Wiki <http://www.pacificbulbsociety.org> version February 11, 2014. Web. 11 January 2017. 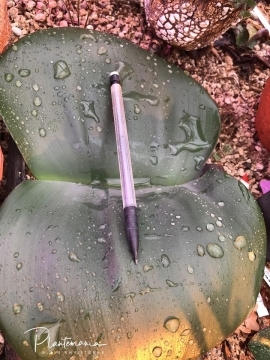 Cultivation and Propagation: Propagation of Haemanthus sanguineus is from offsets, or seeds. The offsets are removed just after flowering and replanted immediately. The seeds are sown as soon as they are ripe. They are removed from the pulp and planted just below the surface or pressed into the soil flush with the surface. They bloom in their third or fourth year.